This car that was in front of me and I were following the school bus when it stopped to pick up the school kids we stopped and waited for the bus the bus then left. But we had to sit and wait for this black lab to figure out which side of the road to take. 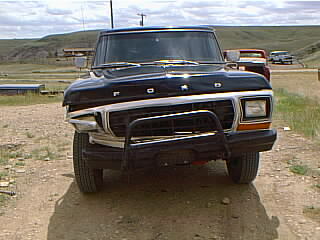 Then I seen a 79 blue 1/2 ton ford 4x4 coming the opposite direction at about 75-80 miles an hour. He then seen the dog and he hit the brakes he slid about 100 feet before he started to go side ways, when he did he let off the brakes at that time he was aimed directly at the car in front of me. He then hit her right in the front spinning the car to the ditch on my right at the same time shoving the car directly into my right front corner of my truck, I was still had my foot on the brake when this all happen. So my truck didn't move at all. I watched my hood fold up in the right corner and seen both vehicles slide into the ditch side by side. I then back my truck off the road to get it out of the traffic lane. The lady driving the car was hurt the worse she hit the steering wheel pretty hard with her face as far I could tell but she was conscious and moving on her own. The driver of the truck got a broken nose and some minor cuts on his face. Also he was at the time only 17 years old the biggest reason why he wrecked was lack of experience. Personally I would have taken the dog over taking a chance on losing control over my truck and risking human life. The dog however had left the scene of the accident right away. 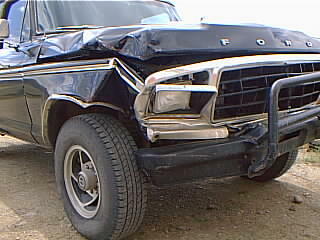 I am think a arrest warrant should be issued for the dog for leaving LOL below is some pictures of the wreck enjoy.